Begonias are my flower of choice this year. 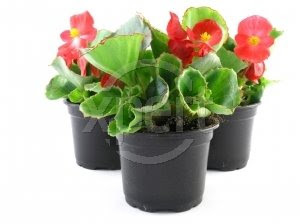 With limited funds for gardening, I decided the big Rieger begonias provided huge red and yellow blooms with fewer plants. They're thriving in my shady front yard. Another delight are the Black-Eyed Susies that sprang up from last year's batch. The plant has at least eight buds ready to burst open any day. To take a cue from a commercial, "what's in your garden?" I appreciate Jody's version too. Thanks, Susan, for mentioning my proposal series! And I just love my flowers too, but actually have to admit that I handed the reins over to my daughters this year. They planted them and are watering and caring for them! And so now they're enjoying the process and I simply get to enjoy the beauty! Love the abundance of blooms and colors of begonias! Been following Jodi and she's done a great job presenting the info on getting published. The picture isn't from my garden. Unfortunately, I don't have one of those nifty digital cameras yet. Oh, I love growing veggies! Unfortunately, the time crunch made it impossible this year. My favorites are tomatoes, cucumbers, and peppers. What did you plant? I follow Jody's blog also. She does a great job. I hope others will pop over and enjoy her many excellent articles. Wow! You're blessed to have someone doing the grunt work. The bending is tough for me. Yummy! There's nothing like produce straight from your own garden. I love reading about Jody's process and have learned a lot! thank you for asking about the ladies group.I was pretty nervous but it was really nice. I asked questions like who encourages you the most, how, and how do you do it, and what was the best day in the past five years, the worst, what is your passion . . . Thanks! Great questions...definitely not the "yes-no" variety.